The establishment of digital posters is one of the biggest breaks for young IT entrepreneur, Emmanuel Narakobi, since setting up his company Masalai Communications in 2001. 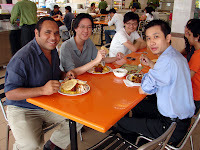 The 29-year-old, (pictured left discussing digital posters with business associates in Malaysia) who turned his back on a lucrative legal career to get into IT, is, however, confident that IT has a big future in Papua New Guinea. Narakobi, of mixed East Sepik and Morobe parentage, is a graduate lawyer of the University of PNG who was bitten by the IT bug. He wears many other hats apart from Masalai Communications such as being general manager of Narakobi Lawyers, president of the University rugby union club, and president of the Port Moresby Rugby Football Union. He is adamant IT can contribute to business efficiency, and contribute greatly to dissemination of information to and from villages. Other major projects Masalai has undertaken are data/voice cabling for the four-storey Post Haus in Boroko; data/voice cabling for the National Fisheries Authority in Deloitte Tower; SMS voting for Ice Discovered on EMTV; and the concept of email to SMS for Australian mobile phones which never really took off. Right now the company is working on touch screens for customer feedback for ANZ Bank and looking at a number of e-commerce initiatives. “I started Masalai in 2001 and I used to work from my bedroom with a dial up connection,” Narakobi remembers. “My interest in IT and initially websites first came from seeing the Trading Post newspaper in Australia in 1999, so I thought to myself, ‘what if we had a website like that newspaper in PNG?’. “I started the http://www.pngtradepost.com.pg/ website and then set about teaching myself how to design websites from a HTML for Dummies book. “The Trading Post website, due a lot to my lack of attention, has not developed as much as it could have but this was what led me into website development. “I met a friend called Phillip Korare who worked in Datec at that time and he taught me a lot of the basic HTML programming to get started. “Masalai itself then came about from meeting two like-minded friends; we thought that we knew something about IT so we decided to give it a go. “I was actually still in Legal Training Institute after law school and I decided that I wanted to do something different which could make a difference. “I know that sounds really cliché but my friends and I really believed that. “They both have since gone their own ways: one is in London now and the other is Brown Omotosho of Nichtosh. “Brown and I are still very close and we still do a lot of projects together. “He specialises in electrical and data/voice networks. Masalai’s progress over the years has been like the proverbial tortoise; however, with the great support of his family and friends, Narakobi is proving that “slow and steady oftens wins the race”. Masalai’s bread and butter is website development, its Content Management System for updating websites without any need for programming skills, and website analytics with Google. Its major clients include Coca-Cola Amatil, PNG Ports Authority, National Maritime Safety Authority, Internal Revenue Commission, PNG Events Council, National Fisheries Authority, NASFUND, PNG Gas Project, Autonomous Region of Bouganville, Independent Public Business Corporation, Pryde Furniture, Ela Beach Hotel, Supreme and National Courts of PNG, Pacific Assurance Group and many more medium to small clients. Masalai has done over 30 websites since 2001 and this year has already picked up about 20 jobs. “I think you go through a lot of different feelings,” Narakobi says about being a young Papua New Guinean with his own IT company. “I feel a lot of freedom in what I think and can do; I think that would be the big benefit. “I guess I’m only restricted by my cash flows and dreams really, so it feels good knowing that. “Of course, with that freedom comes the responsibility I feel of doing something that changes the country, hopefully, and doing it right. “I also do feel a lot of pressure to get things right and it does hurt when I fail at anything or I fail clients. “I currently have six staff with me: three of them are freelance contractors. “Freelancers help keep down my costs and also allow me to source from a wider pool of talent, so I’m not stuck with one creative type of model. “It helps me to source the best talent for any given project. “But I am now looking at increasing my staff numbers this year so I could end up with about 10 by the end of this year. Narakobi feels strongly that more people in PNG must have to have access to IT. “IT is a broad area and if you separate it into offline usage and online usage, then you can understand better where we are at in PNG. “IT’s aim is to share information which means that an online PC or a networked PC in an office will have more usage and demands from the user. “So in PNG, the most-networked PC’s and the most PC’s hooked onto the Internet are the ones in businesses. “Papua New Guineans today are a lot more familiar with IT and what it can do for them. “More people now through Internet at work have email addresses now as opposed to back in 1999. “But IT usage now is primarily in the business world so the social and personal aspect of IT has not been developed enough yet in PNG. “The only way for people to personally interact on the net is in their work time. “Because the total costs for accessing the Internet at home or personally through, say your mobile phone or a PDA is prohibitive or non-existent, and that is a direct consequence of the pricing hurdles set by ISP’s and Telikom’s Tiare Gateway. “Businesses bear a lot of costs for IT now and they can afford to, even though it is expensive, but until the cost for personal access and overall access of Internet is lowered, we will continue to lag by 5-10 years behind the rest of the world. “So two things need to be done. “Firstly, Internet prices need to drop so Internet penetration rates can be increased; and secondly, entrepreneurs and businesses need to show consumers how their daily lives can be improved and be more efficient with IT initiatives, and I mean initiatives that can touch everyone in PNG from the cities to the villages. “The future is bright and since we still have a long way to go, the only way is up so to speak. “Internet prices will drop and the different forms of accessing the Internet will increase, whether it be from a PC at home, a PDA at a restaurant, your laptop at a hotel lobby or your mobile phone in your hand. For further information, visit the website http://www.masalai.net/ or call Emmanuel Narakobi on telephone (675) 323 6266, mobile (675) 683 6231, or email emmanuel@masalai.net.